Since 1930, Central Library has served the residents of Rochester and Monroe County and has functioned as the hub of the Monroe County Library System since 1956. Central Library is made up two buildings, the original 1936 structure, Rundel Library, and the Bausch and Lomb Library, built in 1997, located across the street. This library not only offers the residents of the City and County the largest collection of books, magazines, music, and movies, but also provides quiet study spaces, public meeting rooms, a variety of free programs and opportunities for community engagement. 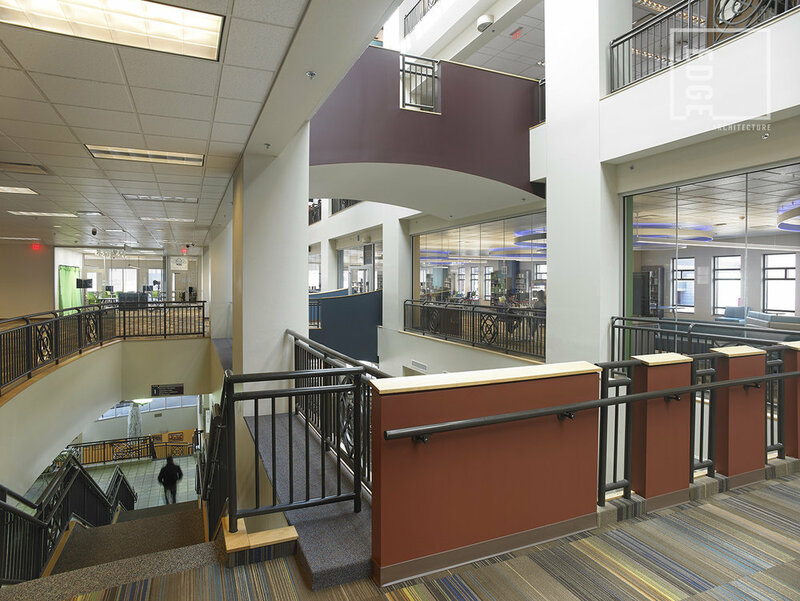 Edge Architecture was commissioned to design and oversee construction of Phases 2 & 3 of the Master Space Plan, that included areas located in both buildings of the Central Library. 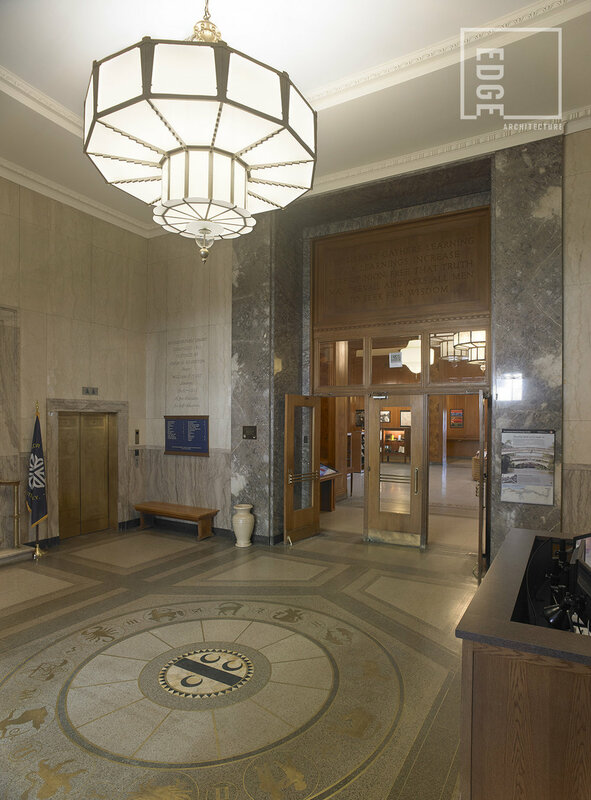 The Central Library is going through a transformation, continuing to provide traditional library services in one historic area, while becoming an innovative library for technology and content creation in another. Rundel’s rejuvenation provides inviting opportunities to the community beyond traditional library stacks, whereas across the street, a more contemporary environment engages the teen community. Master Space Plan Phase 2 “Rejuvenate Rundel”, involved the relocation of the Art, Music and Recreation stacks from the Bausch & Lomb second floor to the north wing of Rundel’s first floor. As Rundel is a historically-listed building, the design challenge of this space was to integrate new makerspaces within a traditional library building, provide new mobile display systems for trending literature within the main hall, integrate state of the art lighting for exhibit, and restore historic features and finishes throughout Rundel. 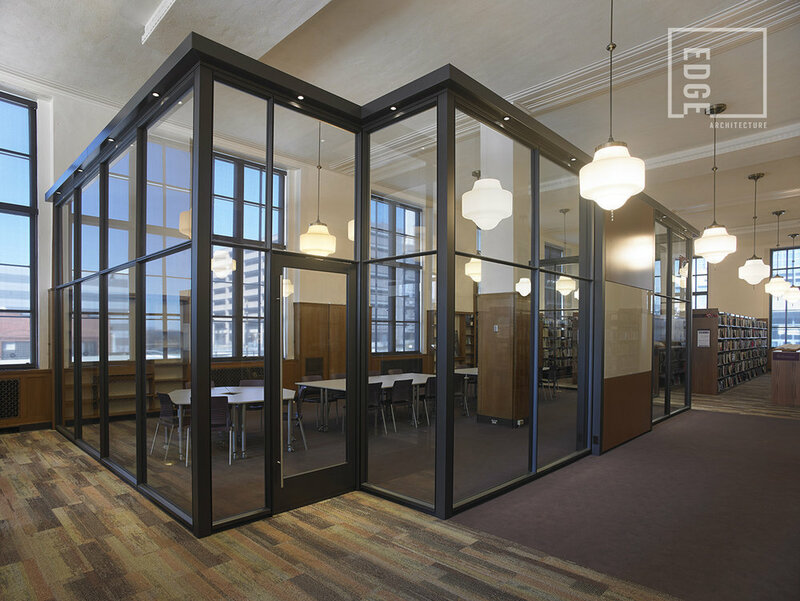 The enclosed multi-purpose makerspace, integrated amongst the Arts Collection, was especially designed to aesthetically mimic the existing historic datum and rhythmic spacing of the Rundel Library space. The main hall hosts a rotating exhibit space that was added to the perimeter gallery. Accent lighting highlights framed poster preservations and exhibit cases found throughout. The main chandelier, seen just inside Rundel’s main lobby, was researched and re-created for the entry foyer as the central feature. Offering the latest technology within an environment that is bright, engaging and hip, the space in Teen Central is purposefully arranged to provide multiple activity areas and promote social interaction. Co-located to Teen Central is the ImagineYOU Digital Media Lab, a digital learning space, where teens can produce and edit music or videos. ImagineYOU inspires collaboration and creativity. Acoustically, the glass provides sound control while the transparency allows for visual control for security. 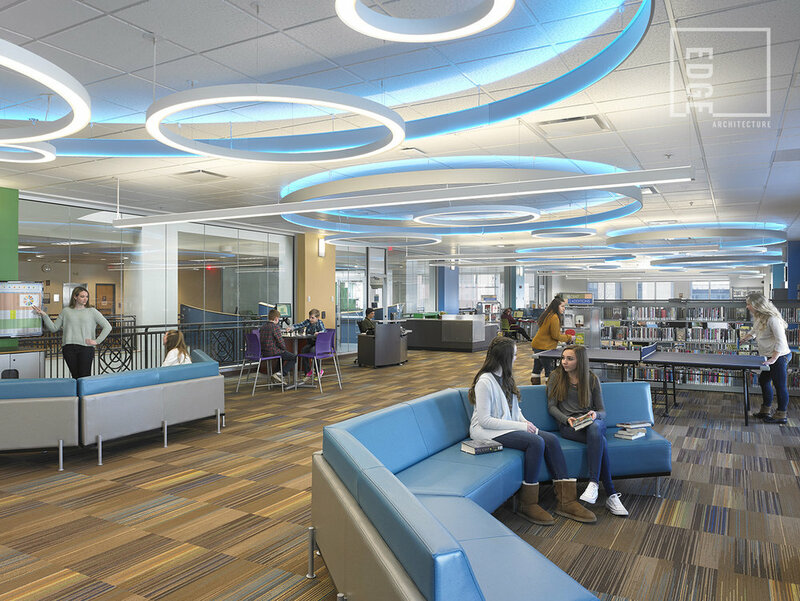 Overall, the use of glass paired with the varied furniture selection and color-changing LED lighting in Teen Central creates a space that is prominent and engaging for the Rochester community’s youths. Master Space Plan Phase 3, “Transform Teen Central”, involved the relocation of Teen Central from the lower level of the Bausch & Lomb Building to the second floor of Bausch & Lomb vacated by Phase 2. The challenge of this phase was to create a space that was not only fun and playful to appeal to teenagers, but one that would help increase visitor traffic and usage as well. The design challenge of this space was very different to the work that was being done just across the street, as it was to provide a dedicated teen space in a prominent location that was visually exciting, but also integrate literature within a social environment that can also provide unique amenities, acoustical separation from the main library, as well as subtly integrate security measures. In only one year since the Grand Re-opening in March 2017, Teen Central has experienced a 62% increase in traffic.